Discussion in 'Gaming (Software and Graphics Cards)' started by margroloc, Mar 4, 2017. Its still the same, it would seem that the burn in and ghosting is permanent. Looking to put an order for a new screen soon. Managed to reach 64 Hz on a 4K/UHD XPS 15 9550 with a SHP143E panel. I mean, it is an improvement but it's so slight that it's unnoticeable. I suppose this barely counts? margroloc and Vasudev like this. Hi, I am having trouble doing this at all. I updated my intel hd630 to the lastest drivers. I have a Acer Nitro 5 gaming laptop. 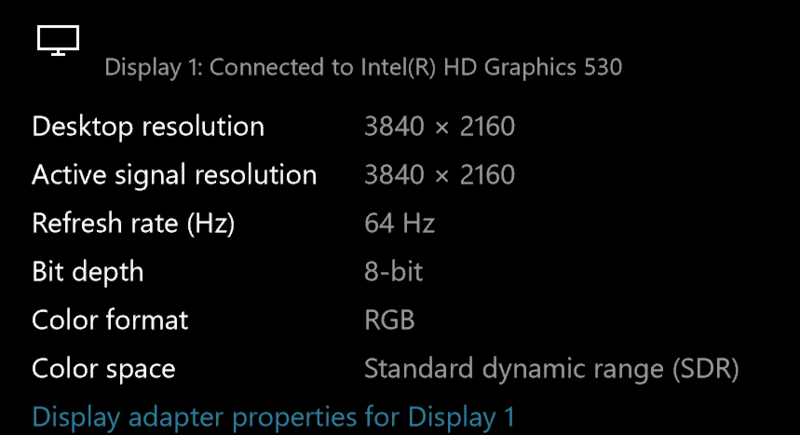 After updating, I could manually set the refresh rate to 75 hz on the intel graphics control panel but it would just be black and revert back to 60hz. I tried doing the CRU route, but all I got was black screen and a revert. I am lost in terms of what to do. I saw that someone else was able to overclock to 100hz with the same computer so I confused. OCed my laptop IPS monitor connected with presumably eDP 2 lane (Model no. in description) to 74Hz. To be noted: Anything in the Detailed resolutions above 63Hz wouldn't work, giving me artefacts for half a second and going blank with only the backlight on. Only the resolutions in the standard resolutions would work, as I learnt today. I could go higher, but anything above 72Hz, it seems, image quality drops significantly. So I ended up with 74Hz. No frame skipping either (100 ISO on phone camera). The image quality on 74hz is noticeably lower but bearable. 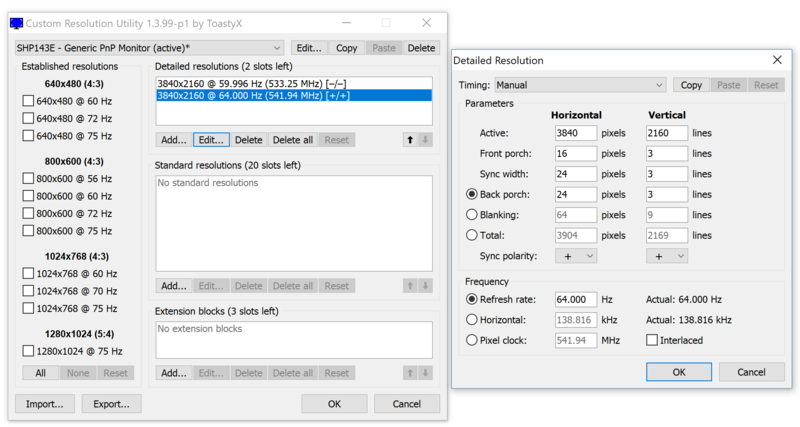 Apart from calibrating the display in windows (adjusting that vertical gamma slider) is there anything else I could do to improve image quality and thus increase my overclock? I set the refresh rate up to 75HZ, restarted and the screen isn’t rendering at all. I can’t figure out how to undo the changes I made, I tried resetting my laptop to a previous save point but I don’t have one as I haven’t had the laptop for very long. Please help me! margroloc, Vasudev and Ionising_Radiation like this. But: Climbing up over 80hz, the Display will start to Show faint lines on dark gray. It Looks like every second line is a Little bit darker. But it does not really bothers me, the Picture from a normal viewing distance is still fine. hmscott, margroloc and Vasudev like this. I read the whole thread but can't seem to manage to overclock my display. Notebook is a Lenovo Thinkpad T440s, with i5-4300U CPU and Intel HD graphics 4400, Windows 10 Pro build 1803. I tried with both the newest drivers (20.19.15.4963) and the recommended ones (20.19.15.4568), and both CRU 1.3.1 and 1.3.99-p1. I can't manage to make the custom refresh rate show up in the Intel Graphics panel or the Windows settings. 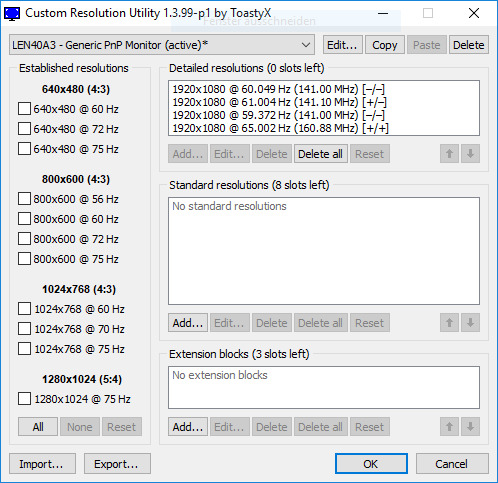 I tried with varying values from 61 to 65 Hz, even 55 Hz, none show up. I tried installing the .INF monitor "driver" from Lenovo but that made no difference at all. I am completely out of ideas. Any of you got some? I have exactly the same Problem with my ThinkPad X240, same CPU. I have other Laptops with this method working, so i know how to do it. First, it seems that it only depends on the Display itself, the Laptop and it's CPU seem to be negligible. Second, i would only see a "Success" at 80Hz+, everything less is not so interesting for me personally. But you can edit the Opening post like you want, if you want to use my Information. FAIL: Stock BOE NV156FHM-N42 V8.0 is crap, could not do 70Hz. As in the other Samsung Panel, some very faint lines appear in Grey Areas, but it does not disturb at all, its almost not visible. FAIL: Acer Swift 5 (Kabylake Ultrabook) with 14" AUO-Display, will look up the exakt model numbar also. 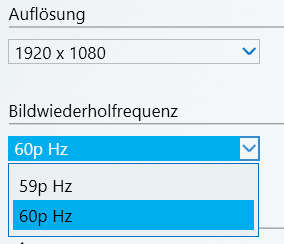 Only goes up to 65Hz. I only use "LCD Native" Timings. Vasudev and margroloc like this. Laptop Panel Overclock ability dependent on CPU/GPU?